Come and sing beautiful four-part a cappella harmonies with Geelong Harmony. Call Cynthia on 0406 666 737 for more details, or come and watch us rehearse on a Monday night from 6.45 to 9.30 pm at the Western Heights Uniting Church Hall, Douglass Street, Herne Hill. 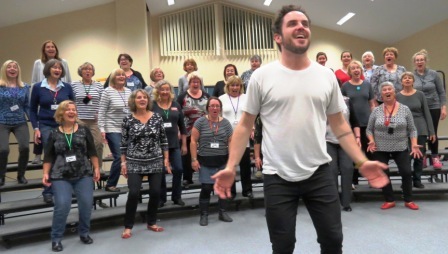 Geelong Harmony offers you fun AND seriously good singing. You don’t need to be able to read music because we learn our repertoire from high quality recordings and sheet music. Our Musical Director provides vocal coaching to everyone as we rehearse. Coaches from Canada, the US, Sweden and Australia also instruct us during special workshops on voice production, harmony singing techniques, stage presence and performance skills. We perform at local Citizenship Ceremonies and festivals, like Geelong After Dark. And each year we have the opportunity to perform interstate at the Sweet Adelines Australia Convention. This entry was posted in News and events by Geelong Harmony. Bookmark the permalink. Interested in joining or booking Geelong Harmony? Get in touch!